Guys! 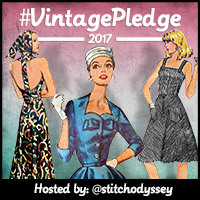 Your appetite for joining in with the Vintage Sewing Pattern Pledge (#vintagepledge on Twitter) has quite literally blown me away! I announced my idea less than a month ago and there are already over 100 of you joining in! To say I'm delighted is an understatement. Not only that, but some of you have been ridiculously quick off the mark, so I'm excited to share a round-up of finished makes below. But first, a cheeky giveaway to get even more of you on board....mwahahahahaha! Plus, I've not had a chance to fully participate in Debi's wonderful Sew Grateful Week this year, so I'm hoping this will make amends...even if I am posting it on the wrong day! This giveaway is open to anyone, anywhere! There will be 4 winners, so just leave a comment telling me which pattern you'd most like to win -please make sure you leave leave your email address so I can get in touch. Enter by midnight GMT on Friday 7 March. Winners will be announced on Sunday 9 March. What's the catch? 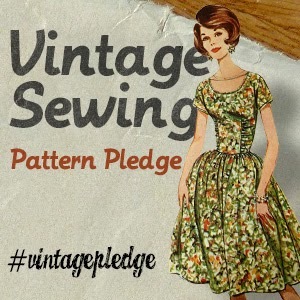 If you win you have to promise to make your pattern up this year, as part of #vintagepledge. Simple! Now, let's get a load of some of your beautiful makes! I don't know about you, but I'm all fired up again now! 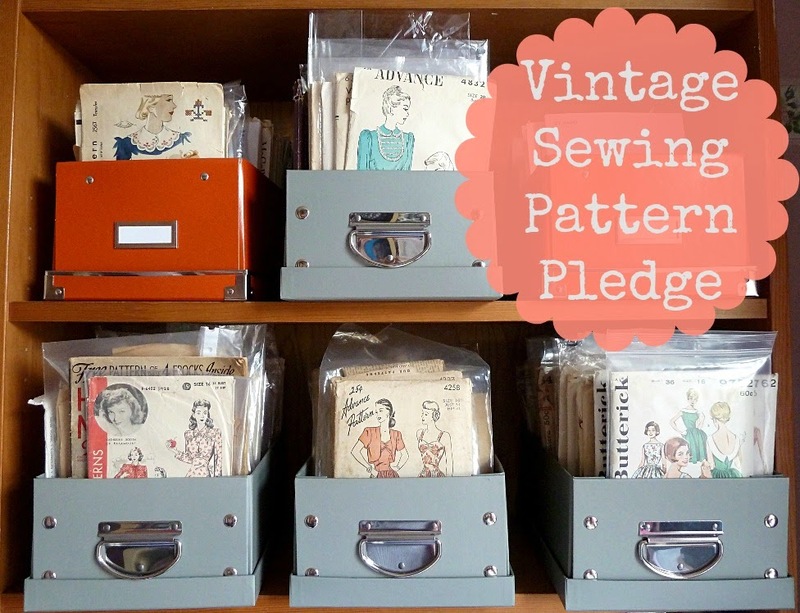 You can join the Vintage Sewing Pattern Pledge any time throughout 2014 and there are no set rules. 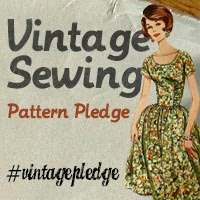 You can also join in on the Twitter fun using #vintagepledge. If it's inspiration, ideas and finished projects you're craving, then check out my dedicated Pinterest Board. See you on the #vintagepledge wagon! Not too long ago, I opened up to you guys about my aversion to zips and love affair with buttonholes. 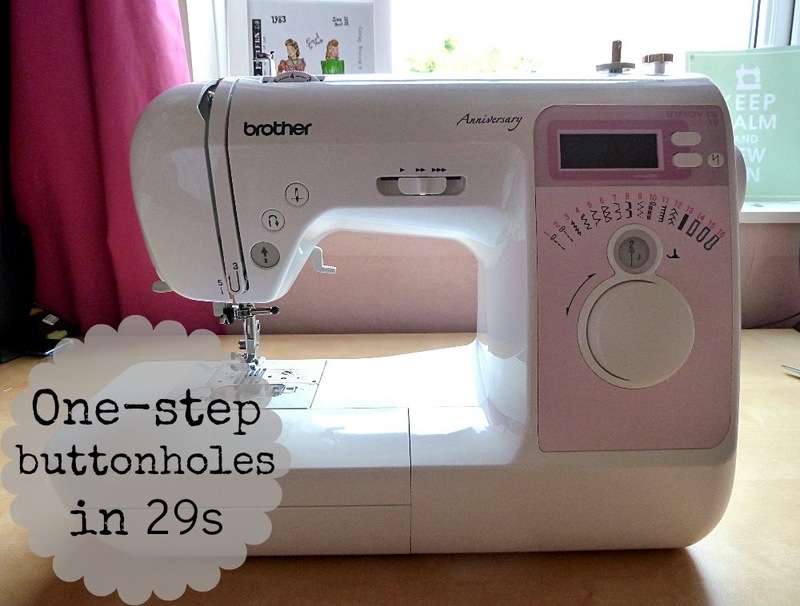 The thing that surprised me most about your comments is that so many of you feel the opposite, in that you struggle with and dislike sewing buttonholes. I'm quite baffled by this! I don't mean to brag, but my middle-of-the-range machine (a Brother Innovis 10A) does one-step buttonholes quickly, effortlessly and consecutively. If you're in the market for a new machine, I would suggest you give a lot of thought to the buttonhole function. In the meantime, I thought I'd take this chance to just show you how a machine like mine executes buttonholes, as it might be useful as a comparison. Turn the dial to one of the three different types of buttonholes available. Number 14 suits regular fabrics, whilst 15 and 16 are best for thicker ones and fabrics with a pile. Being a computerised machine it automatically picks optimal stitch settings for you based on regular fabrics, so you'll need to adjust manually if sewing with something less conventional. You then place your button in your buttonhole foot, making sure it's nice and secure, and attach to the presser. Before you start sewing make sure you pull your buttonhole guide all the way down. This acts as the sensor, telling your machine when to turn around and ensuring your buttonhole is the right size for your chosen button. All that's left to do now is line up your buttonhole foot on your marked fabric and hit that foot peddle! Not a bad result in just 29 seconds eh? Obviously the exact timing depends on you and how fast you're comfortable going. Here's a sample of each buttonhole for you to feast your eyes upon - 16, 15 and 14. However easy the above seems, many of you have said that despite managing perfect test buttonholes, when it comes to the real thing your machine plays up. I've been thinking about this and I actually remember having the exact same problem with my old Janome, which had a 2 or maybe even 4-step buttonhole setting. It turns out that my Janome didn't have a good 'memory', so I had to re-set everything each time I embarked on a new buttonhole. Although this was a tad more time-consuming, it did do the trick. So regardless of your machine and buttonhole setting, if you're experiencing issues between buttonholes,, just try switching your machine to a different setting and back again before each one. It might also help to raise and lower your buttonhole guide each time as well. Hopefully this simple solution will lead to flawless buttonholes for you too! Tuesday was a pretty exciting day. 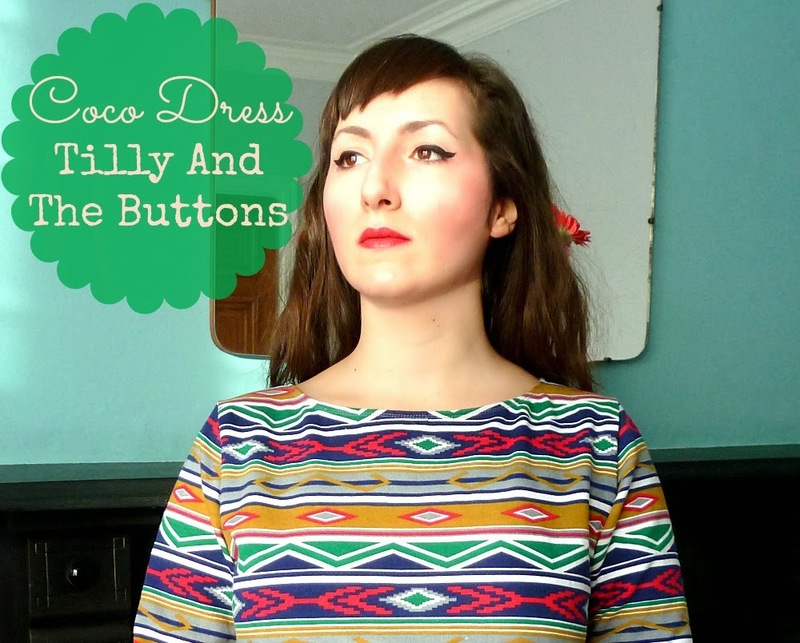 Not only did the Great British Sewing Bee return to our TV screens for a second season, Tilly and the Buttons released her third sewing pattern...which I had the absolute pleasure of testing! The Coco Dress is Tilly's third pattern and her first available in both print and digital formats. 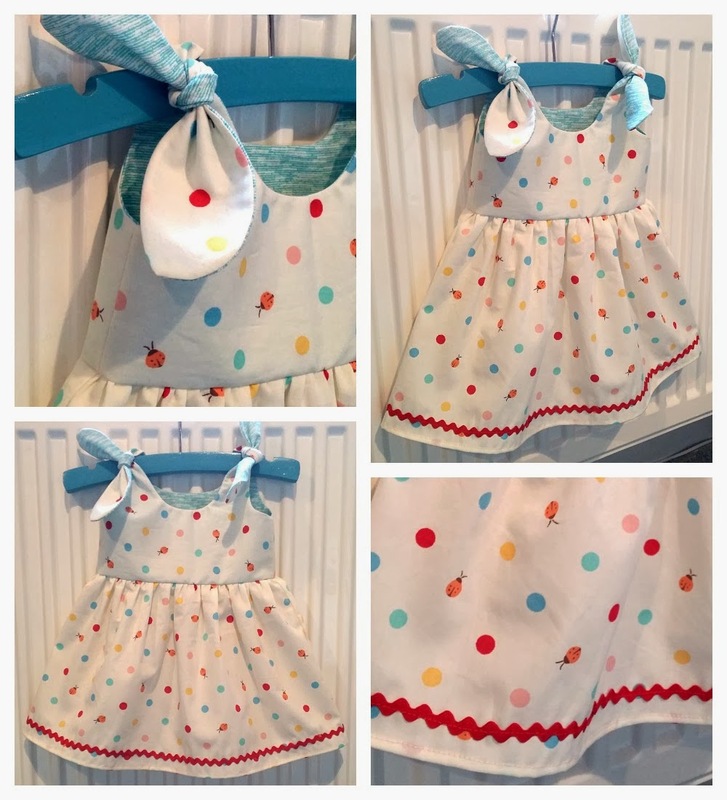 It's designed with stable knits in mind, sews up very quickly and can be done so using a regular sewing machine (not just an overlocker), making it hands down the perfect pattern for beginners and anyone apprehensive about sewing with knits. 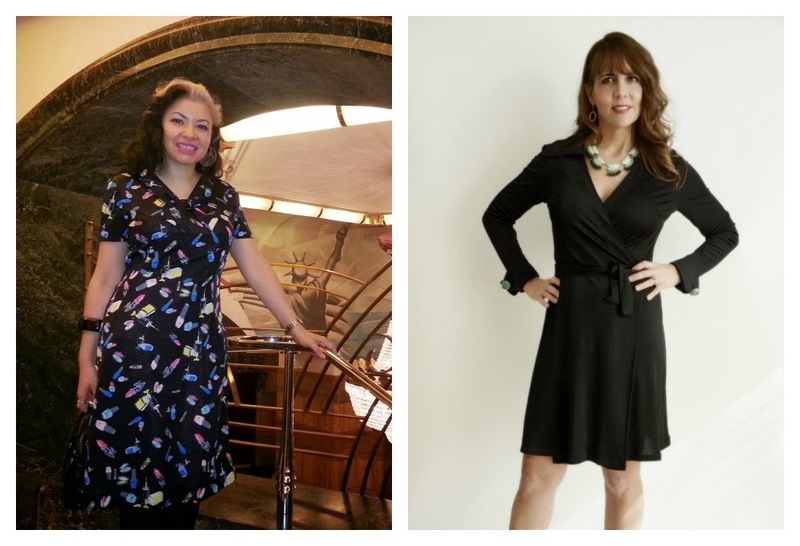 However, the number of possible (and seemingly endless) variations - dress or top, long or three quarter length sleeves, cuffs or cuff-less, pockets or pocket-less, slash or funnel neckline - make it a pretty fun pattern for the more experienced stitcher too! Coco is quite literally beautiful, inside and out! As always, Tilly's step-by-step instructions and accompanying photographs are second to none. She's also added extra pattern markings to make the whole cutting and stitching proces as clear as possible - outlined here. Hand-holding doesn't get better than this! For my version, I used a fleece-backed, medium-weight knit from Minerva Crafts. The Aztec print and vibrant colours are so much fun on bleak winter days and the fleece backing keeps me nice and toasty. It's an undeniably busy print though, so I went for the simplest version of Coco - slash neckline, cuff-less and pocket-less. My version of Coco only requires three patterns pieces, so fitting and construction is a total breeze! With proportions are all over the place, I cut a Size 3 for the neckline and shoulders, a Size 4 for the armholes down to the waist and a Size 5 from the waist downwards. Due to the simplicity of the pattern lines, grading like this is really easy to do, so don't be afraid to have a go if you're in between sizes. I love that Coco's slash neckline isn't finished with a neckband, instead it's turned under and topstitched. This results in a cleaner and less casual finish, but I have found that this method can be prone to gaping and the wrong side peeping out. To prevent this by stabilising my neckline, I stitched stay tape to the wrong side of my neckline before turning under and topstitching. It worked wonders! Finally, I topstitched the neckline, sleeves and hem using my trusty twin needle. The only small change I would possibly make next time, would be to slim down the sleeves just a smidgeon...but that's easily done and just personal preference really. I'm ridiculously pleased with my stripe matching skills by the way! I know I'm a complete geek for saying it, but I don't think I've managed to match anything this well before! Like everyone else who has tested or made Coco, I give it a big thumbs up! It's a cute design, versatile, easy to sew up and the perfect pattern for beginners and experienced stitchers alike! If you're tempted or need a little more inspiration, check out Tilly's Pinterest board chock full of design and fabric ideas, as well as 'real life' versions! I've been admiring leather skirts for a while now - this one especially - so I figured I'd be a bit adventurous with my second project for the Minerva Blogger Network and give making one a go. I ordered some black pleather - and other handy bits which are included in my kit - and got busy. I had ambitious plans for the design of this skirt, but as I started playing around with ideas, I found that the simplest worked best. 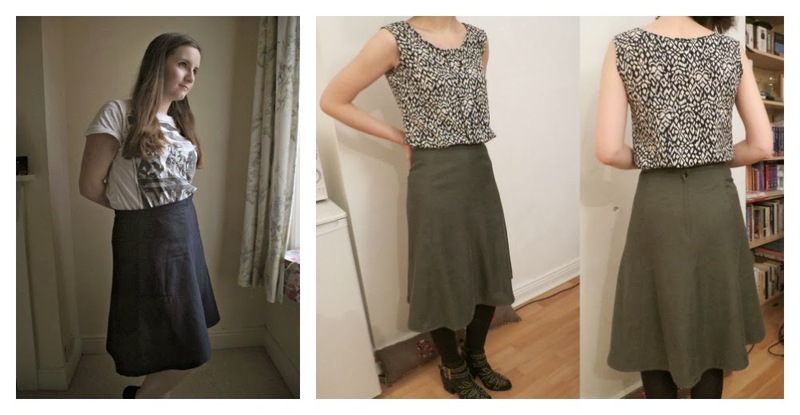 So I drafted a simple A-line - using my first ever self-drafted skirt pattern as a basis - and loved how it looked. I was going to draft a waistband as well, but the skirt already sat quite high on me, so I simply turned under the waistline once and voila! The pleather is sturdy enough in itself so no facing was required! To avoid this becoming a boring black skirt, I tried to imitate elements from my inspiration design. 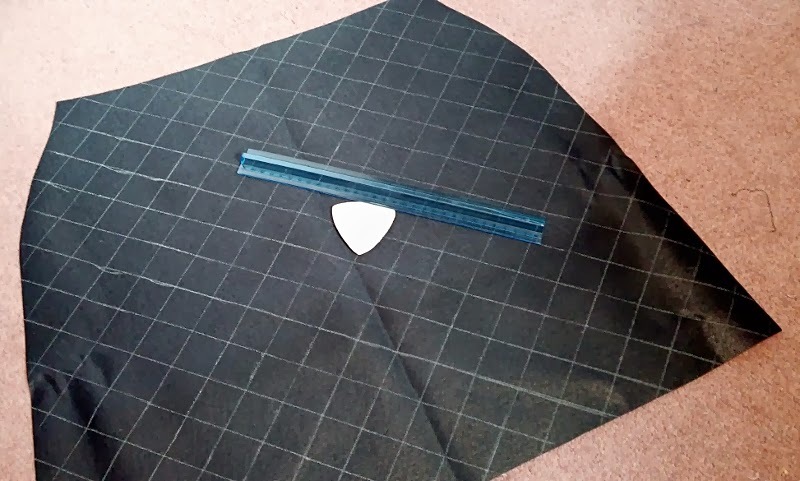 Using chalk and the width of my ruler I marked out 'quilting' lines on the wrong side of the fabric and stitched along them. Although my skirt isn't actually quilted - I literally wouldn't know where to begin! - I do like the subtle texture this has added. I also inserted an exposed zip, mainly for 'rock-chick' aesthetic reasons, but also because the idea of inserting any other kind of zip with pleather terrified me! Before getting down and dirty I researched lots of tips on sewing with leather, which although were extremely helpful, did make me apprehensive. However, I get the impression that pleather is less tricky to work with and I was pleasantly surprised by how easy sewing it up turned out to be! I pre-washed my fabric at 30 degrees, even though handwash is advisable, but it was fine. I used a suitable needle, slightly increased my stitch length and it was plain sailing from there really. Contrary to all advice, I did pin my fabric, but only within the seam allowances so that the perforations wouldn't show on the right side. I used a pressing cloth when ironing to avoid melting my fabric! The only thing I didn't get on with was the hemming tape included in my kit...it didn't really stick that well for some reason. So I bought leather glue instead, which I used on the waistline, hem and all other seams to great results. A heavy book and some bulldog clips came in very handy at making sure everything stuck down nicely! Be warned though, bulldog clips can dent your fabric, so I'd recommend putting some padding between them and the fabric...some cotton wool, a sponge...anything! 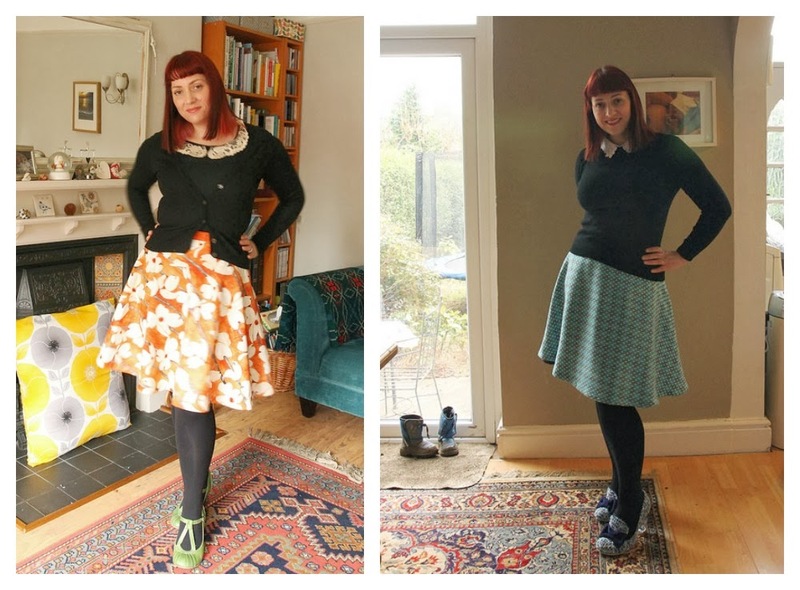 My love-hate (mostly hate) relationship with skirts is well documented on this blog - it stems from the fact that I have to wear skirts high up due to my muffin tops, but being short-waisted with a large bust, I end up looking like I have no waist at all! However, I frigging love everything about this skirt...even the way it fits and looks on me! I think the simplicity of the shape has something to do with it, but mostly I think they key is a fitted cropped top! This trick has worked for me before with my Miette, so what I need to do is 'rub off' the two tops in question, make about a million of them and start a full-on love affair with skirts! Amarite?!? The number of you who kindly took the time to comment on my fringe (or bangs) dilemma. It turns out, hairstyles divide opinion, like, A LOT! I honestly can't believe the truly considered and refreshingly honest advice and opinions you all chipped in, so thank you! You'll either be glad or disappointed to see that I stuck to my guns and kept the straight fringe. It's a little longer than before and I opted for a very subtle Bettie Page curve. What do you think? The number of you taking the Vintage Sewing Pattern Pledge with me! I'm thrilled that so many of you are on board and I look forward to all the inspiration and support - I know I'm already feeling more motivated. The number of finished makes that I can't share with you yet. Frustrating, but hopefully worth the wait! One super cute Itty Bitty Dress made by me for our adorable new niece, who's less than two weeks old! The grand old age I turned today! No handmade dress to celebrate in like last year, but thankfully not as stressful as turning 30. Plus, spending time with wonderful friends and receiving awesome gifts is always a winner! Hope you're all having / have had a wonderful weekend! 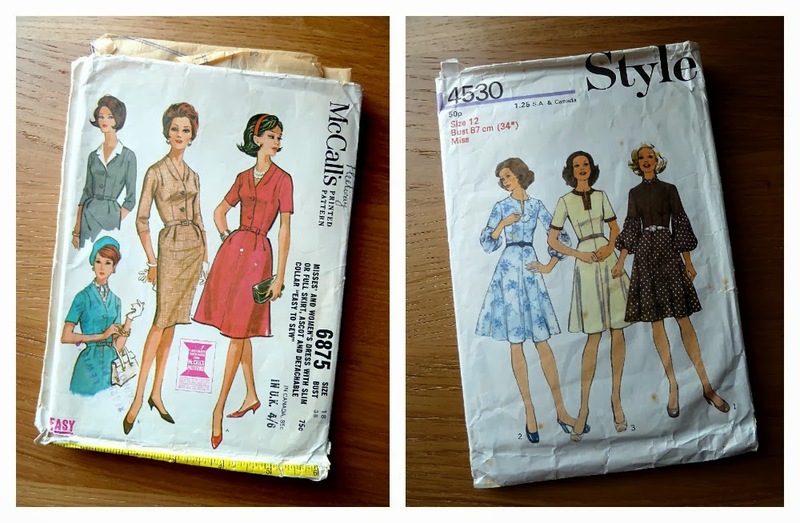 The irony of recently guest blogging about what attracts me to vintage sewing patterns is not lost on me. I have a pattern stash almost as vast as my fabric stash, yet I've hardly sewn any of them up. Mainly because I'm so easily taken in by the frenzy surrounding the release of any new indie pattern, but there's got to be room in my stitching life for both...right? Otherwise, what's the point of collecting vintage sewing patterns in the first place? 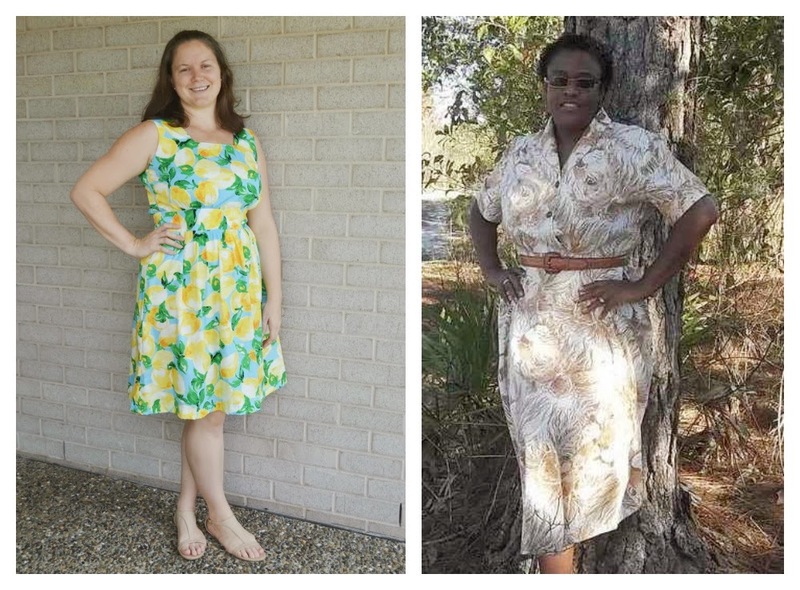 During 2014, I, Marie Koupparis, will sew up at least five of my vintage sewing patterns. The question is, will you join me? There are no strict rules and you don't even have to set yourself a numerical target. 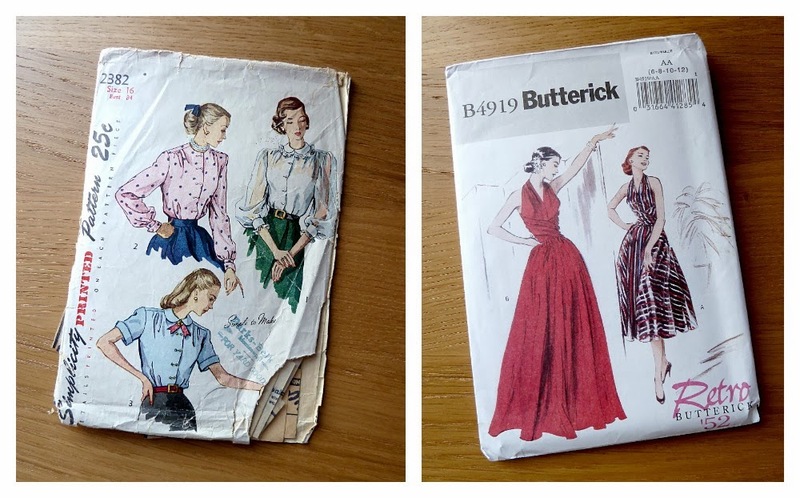 You can join in if you feel you're not doing justice to your vintage or reproduction sewing patterns, if you want to achieve a personal best, or even if you want to try your hand at a vintage pattern for the very first time! Tell me your plans in a comment below and/or make a pledge on your own blog. 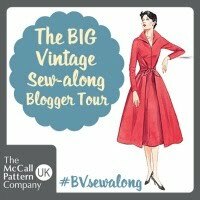 Then share your finished makes with me either in the comments, by using #vintagepledge on Twitter or via email - I'll tweet about them and pin them to this board. If enough people join in and enough finished makes, I'll also compile a few round-ups on the blog throughout the year. 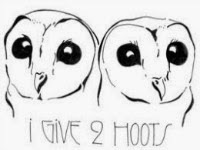 And because some of you asked, my talented boyfriend made us a button...so grab one and spread the word! Below are just some of the patterns I'm toying with. Can you believe I started and gave up on the first two years ago due to fitting issues? 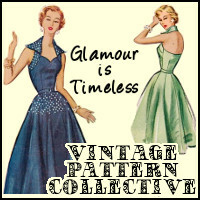 I also hope to make a dent in my vintage fabric stash in the process!